During the preparations for the Eye's centenary we tryed to find out more about her history. Very helpful was a book published in German "Vom Segel zum Motor" by Herbert Karting, with his recherche about all the Lührung vessels. The book and some emails by the Author helped to clear up some foggy and mysterious spots and periods of the history of the Eye. Also, we could learn that a number of Lühring vessels became pretty old - i.e. Anny von Hamburg, built in 1914, is sailing the Caribbean now. One of the mysteries was i.e. slight differences between the plans of the Eye and her real measures and some faint remarks on the plans referring to a different ship: the topsail schooner Meta, built by Lühring same year. From the book we learned, that in fact her first owner Johann Friedrich Kolb ordered a ship with the same hull as Meta, only with slight changes. A painting of Meta under full sail can be seen in the Elsfleth Museum. According to the book, Meta sailed North Sea and Baltic until the end of WW1, when she was handed over to France. The new owner added the first engine in 1921 and operated 1922/23 in Marseille. Then, she was sold to Carlo Pezia in Viareggio/Italy and later to Giovanni Marchetti, also from Viareggio. 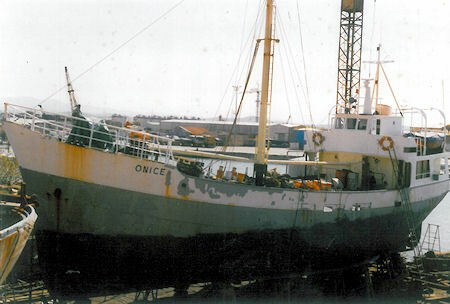 Still carrying her old name and rigging, she then was sold to Livorno and was renamed in 1954 to Onice (onyx). 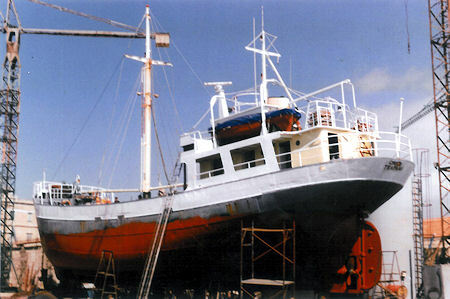 When the book was printed in 1993, she was operating as a freighter by Francesco Lentini between Trapani and Pantelleria. 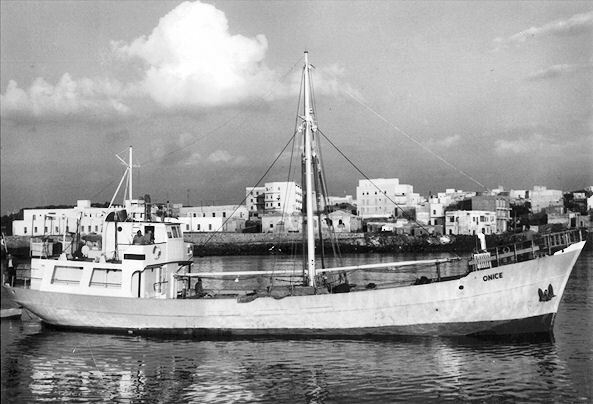 The ship operated as a cargo based at Pantelleria, carrying goods and eventually gas for domestic use, the only kind of goods that were unsafe to carry on the bigger modern passenger ships connecting the island with Sicily, the ones that pushed the Onice out of business. Our attempt was to find some pictures of the Onice, for the occasion of the Eye of the Wind's centenary. My research via internet was not successful (I live 1000 Km away from Pantelleria), but at the very last minute I was lucky to find out that a good friend of mine, Mrs Paola, was going to spend a short holiday on that island. It just happened last week. So I asked her to kindly gather as much information as she could about the Onice, which was reported being demolished in 1998. While she was there, Paola could meet the former owner Mr Francesco Lentini, now in his eighties, who gave her the ship's photo that is herewith attached. The former captain, Mr Minardi, is also an old man, but unfortunately not in good health anymore. 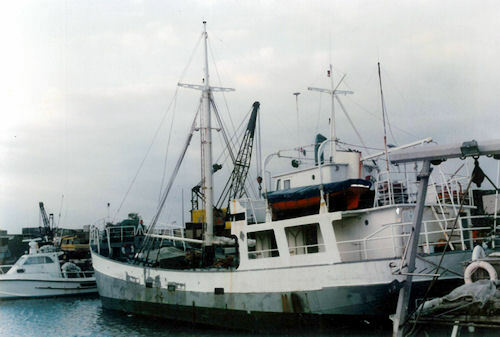 By the way, Paola knew from Mr Lentini that the Onice was sold years ago to a new owner in Trapani (Mr Antonio Miceli) and that now she is rusting at a shipyard in the harbour of Trapani (Sicily). 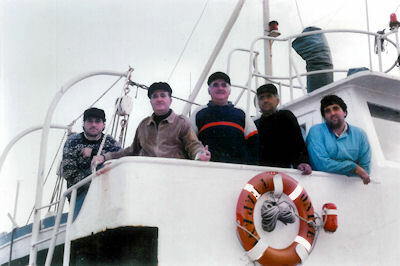 Paola also photocopied an article of many years ago about the ship, and brought back to Milano four smaller photos, one showing the former owner, captain and part of the crew. Many thanks, Paola! Breaking news: Onice is making steps back into life! Visit her on Facebook at Brigantes or her website www.brigantes.eu.